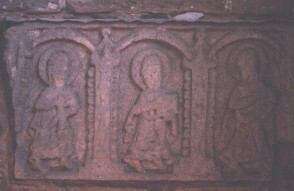 The three figures on the right of Mary seem to be moving to the right. They all seem to be carrying books. The figure on the right is dressed like the figures on the left of Mary. The other two are dressed differently. They look to be wearing an overgarment, where the frill hem is at about calf level.